Did you ever wonder what birds might just fly over your house, while you are sitting at home? I´m sure that most birders do. In fact most birds are passing over without being noticed. However thanks to GPS-Tracking it is now possible to literally follow the migration route of a couple of birds. This also means that some birds which are extremly rare can be recorded, even though no birder has seen them. Exactly this happened in the autumn of 2015. A few days ago I was surfing a bit on the internet and also came across a spanish birding website, which featured a GPS-tracked Greater Spotted Eagle hybrid in one of its more recent blog posts. When I was looking on the attached map, I was very astonished to see that this eagle had also crossed Southern Germany on its way to Spain. 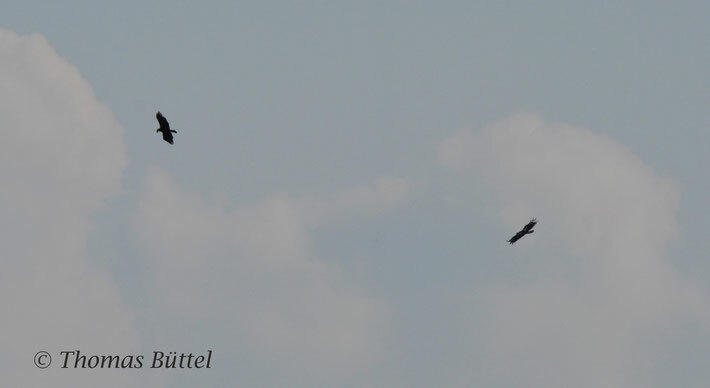 I zoomed in the map and was very much surprised, since the hybrid eagle had apparently gone straight over Bamberg. A truly remarkable record! Why is it so remarkable? Both Lesser as well as Greater Spotted Eagles are extreme rarities in the most parts of Germany, the first however breed in low and unfortunately declining numbers in Brandenburg and Mecklenburg-Vorpommern. Since especially the Greater Spotted Eagle is rapidly decreasing and therefore seriously endangered, an increasing number of mixed pairs are reported, which means that hybrids are becoming far more common. Already under normal circumstances the identification is not easy, but when also the possibility of a hybrid must be taken into account, it is in some cases not possible. Therefore a GPS-tracked individual is perhaps the only way to get a "good" record. Franconia has seen two further noteworthy records by GPS-Tracking: The first was the famous "phantom-eagle" Tönn (a Greater Spotted Eagle as well), which had crossed Germany twice a year since 2008, but had never be seen until it was first spotted in the spring 2013 in Oberkotzau near Hof. And finally there was the Bearded Vulture "Bernd", which was wandering a lot through Germany and went several times over Bamberg (see here for the track). However the transmittion of the GPS-Tracker eventually stopped in August 2014 near the franconian town Kronach, where the Vulture had lost its transmitter. A few days later it had been found weakened in Saxony.